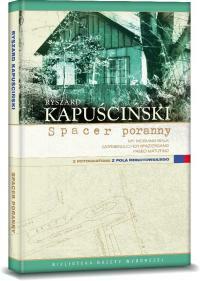 The publishing house Agora has marked two years from Ryszard Kapuściński's death by publishing Spacer poranny, an essay with photographs found in the writer's archive and first printed in the local Warsaw insert of Gazeta Wyborcza two days after Kapuściński died. Attached to the Polish-language text are three translations: into English - "My morning walk" - by William Brand, German - "Morgendlicher Spaziergang" - by Martin Pollack and Spanish - "Paseo matutino" - by Agata Orzeszek, as well as facsimiles of the typescript with Kapuściński's handwritten corrections. The afterword brings Alicja Kapuścińska's recollection of the first walk with her husband in Warsaw's Pole Mokotowskie park in 1988. There are also seventeen black-and-white photographs which Kapuściński took during one of his strolls through Pole Mokotowskie in 1996. 1996 is probably also the year when Kapuściński wrote the essay, his notes saying "Spacer poranny - zataczam koło swojego życia, okrążam świat 1945-1995" / "My morning walk - I am rounding the circle of my life, 1945-1995." "It is also our intention to include the restored houses at Leszowa Lane in the itinerary following the path walked by the author of 'The Empire', and to open a park café in the one in which Ryszard Kapuściński lived with his parents for ten years. After a walk, you could stop there for tea or coffee and, surrounded by objects which once belonged to Kapuściński, take one of his book from the shelf and immerse yourself in it." Bożena Dudko developed the concept of the book and Izabella Wojciechowska selected the photographs. The design is by Krystian Rosiński.